I had actually considered my story in the context of ‘hope’ even before you’d contacted me. Before I started making the videos I was incredibly depressed with my life – stuck in a dead end job, overweight, unhealthy, no social life etc. With the confidence I gained from the feedback I received from making the videos I ended up losing a lot of weight, getting a better job (which I was later able to quit entirely!) travel across the States and make lots of new friends. It’s genuinely changed my life in ways that I never could have dared imagine when I first started. On top of that, I receive comments frequently from people who say that my lessons have helped them through difficult times and that is also hugely gratifying. Summary: John’s answer to the five questions! Listen to the full conversation on the player above; also available on iTunes, Stitcher and Soundcloud. Hope is just about never giving up and striving to be the best you can be. When I was a kid, I really rooted for the good guys. Do you remember the TV show Quantum Leap? Sam Beckett was the main character and throughout my teens, he was like a role model to me. He was good for the sake of being good because good is the right thing to do. Even if it’s not the easy thing to do. For him, it was important just to be good, to do the right thing. That really resonated with me. A more recent example, have you ever seen the show My Name is Earl? He made a list of all the bad things that had happened to him and then going around to people he’d done something bad to and then making up with them. A lot of the times it was hard for him, but just the mindset of just being good at all cost even if it’s hard appealed to me. Four and a half or five years ago, I was in a really fed-up place. I just turned 30 and my life was not going the way I was…I was stuck in a job that was not challenging me, I did not find rewarding, I did not enjoy. I’ve been to a university and I consider myself fairly intelligent and I was stuck in this job where it was made very clear that there was never going to be any opportunity to advance or to go any further because I’ve been doing it for 10 years. It was going nowhere. I was also stuck in a really bad apartment. I could barely afford to live there, but I also couldn’t afford to move. I didn’t really have much of a social life. I’ve been obsessed with becoming a wrestling commentator throughout my whole 20s. It’s all I ever wanted to do, to be honest with you. I got to do it for about a decade, but I did it at the expense of relationships, friendships, career, but all the things “normal”, if there is such a thing as normal. Most people spent their 20s getting their act together and I spent it doing what I wanted to do and then I realized I’m turning 30 and actually that’s never going to happen. I’m not living where I wanted to be, I’m not very healthy, I haven’t got any friends, I haven’t got any social life, I hate my job. I really was absolutely down about everything and for whatever reason, a friend of mine bought a ukulele himself and posted a couple of videos of him playing it on YouTube. He was really good at it actually. I was like, wow, he’s very cool, he can play very well, he can sing very well, but there’s something about a tiny ukulele that no matter how cool or good at it you are, it’s faintly ridiculous, it’s inherently amusing. 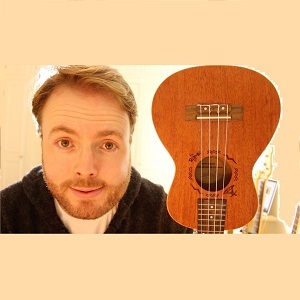 Just for a joke, I went out and bought a ukulele and I set up a YouTube channel. I made this video and it was called The Ukulele Teacher, how to play 100 songs with three chords. It was basically making fun of this guy at work. I posted it on my Facebook page and sent it to him and forgot about it. Whilst the video would’ve been made in fun, it was technically correct so for some reason people started sharing it around and when I checked it a few weeks later, hundreds of thousands of people have watched it and people have subscribed and left comments to it – which was amazingly gratifying. Basically, they said can you make more of these videos? I was like, yeah I guess, no one’s ever asked me to do anything again before. In about a year, I had maybe 10 videos and then I got an email from Google and they said I was eligible to monetize my videos. I just ignored it for a bit and then I thought it was an experiment it wouldn’t hurt. Just to see what came out and the first one I think I made $10 or something. I thought if I could make 600 videos I could live comfortably off of it. I thought it might be something I could actually make a go of which is, thinking about it now, so ridiculous. I don’t know why I even had that train of thought. I don’t know where that came from because I was not that kind of person. After a year of making a hundred videos, I was actually already in a place where I could live off it, so I gave up my job entirely and now it’s been just over a year that being the Ukulele Teacher is all I do and it’s amazing. I do get a lot of comments that are nice. That’s really cool for me to hear and I think that in my day to day life, I try and spread that around a bit. I don’t want to sound the worst person to ever come to for advice, but I got to tell you whenever anyone comes to me for advice my advice is always quit your job. I don’t know if that’s necessarily always healthy advice, but I’m always, always encouraging people to leave the office and go travelling and do that sort of impossible thing that you would never have the guts to do otherwise. I think I’m just spreading my story – I think it’s inspirational. Like I said I was down as I can be and now my life has just changed beyond recognition in about 5 years by taking that leap, by doing something a bit off the beaten track. I try to encourage as many people as I can to do something similar. I’m not saying start a YouTube channel and become an online ukulele teacher, but go travelling to seek what you want to do. We’re not like the big corporations or we’re not chained to the 9-5 HR bracket. We can do what we want. We have one life. Do what you want to do and make the most of it. You only get one. (1) Being nice to someone is enough. (2) Pass on the good vibes. (3) Make somebody feel better about themselves so they can pass it on to others.